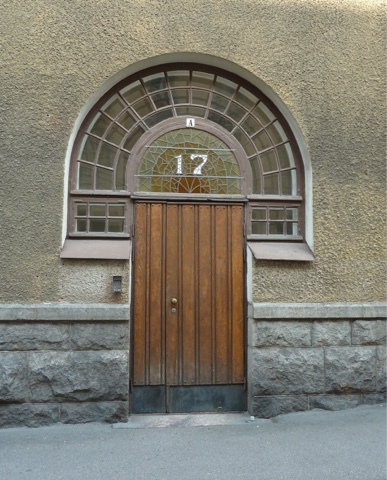 In the early 20th century, a style of architecture known as National Romantic took hold in Finland and the other Baltic nations. I found it most appealing. To me, it looked like medieval meets Craftsman or...I'm just not sure. I realized on the last day, as my battery was dying, I'd been taking pictures of doors. Wish I had taken more. The apartment we rented in Helsinki appeared to be next to a huge park that led to the water. When we walked over to see it, we discover it was a cemetery, an enormous cemetery. It was well cared for, with beautiful huge trees and some unique tombstones, thus most of this post will be photos. There is a much copper in Finland. 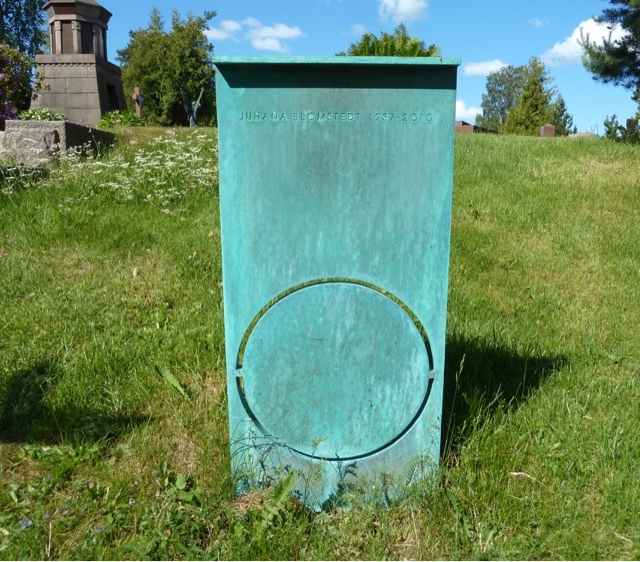 One sees it in roofs and decorative objects, but this is my first copper grave marker. Or polished stainless steel. Many were somewhat more conventional, but works of art all the same. There were a fair number of rocks. And sometime in the late 1800s, stones like these began to become popular and then common; chunks of granite with only one polished surface. 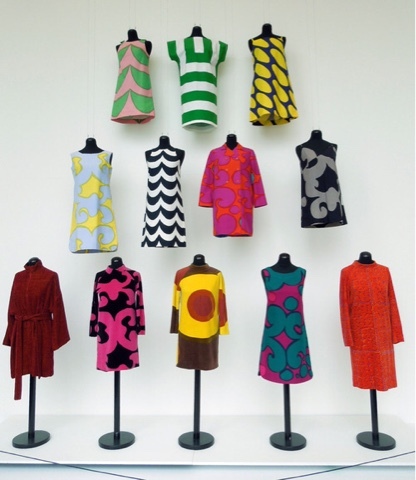 Whether it was done out of frugality or fashion I cannot say. 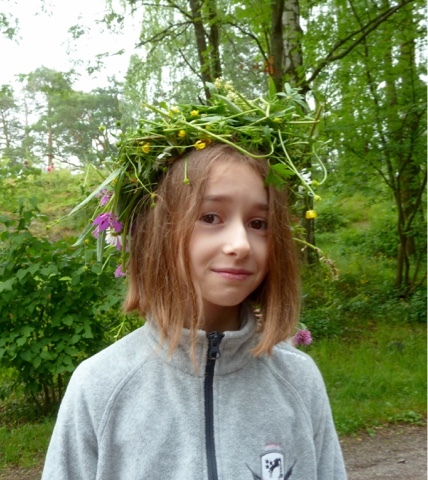 Juhannes - midsummer night, a celebration of the shortest night (which got Christianized as an event honoring John the Baptist, thus the name) was celebrated here in Helsinki on the evening of the 24th and the 25th. As the young woman at the tourist office said, this holiday is as important as Christmas. Flower crowns are worn and most are delightfully wild. The city begins to shut down on the Thursday before. Buses run weekend schedules, stores close by no later than 2 on Friday and most people leave town to a cottage up north, to cook out, sauna, drink and have a bonfire. Here in the city, the "outdoor museum" on Seurasaari Island, presents a celebration that is steeped in history and is very family friendly. Costumed musicians, singers and dancers perform. The woman to the right of the accordion is playing the bird call. 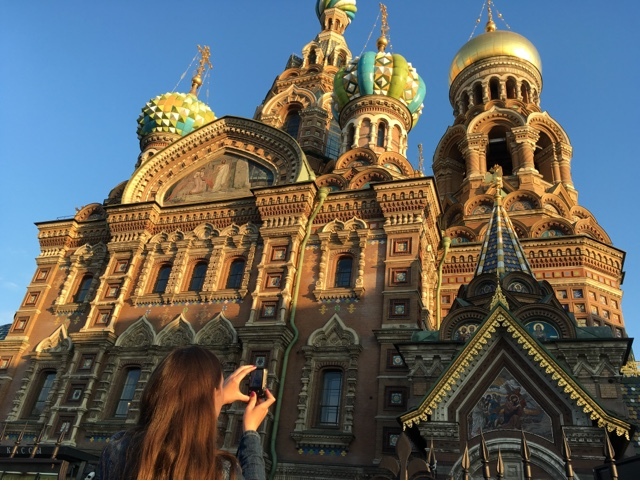 The Russians we talked to (and English is not commonly spoken, even in the heart of the tourist area) want Americans to know that we have nothing to fear from Putin. They say he's a good man, a sincere man. I'm not sure if they love Putin or they simply dont want to go back to a Cold War. 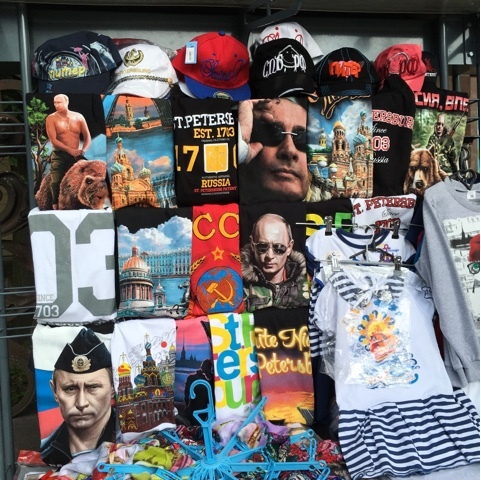 There were lots of souvenir stands around, but the ones in The Hermitage plaza did not carry Putin T shirts. I feel sure they were not allowed, as their meaning could be misinterpreted as making fun instead of deeply respecting. Of course, some people love Putin and think the western leaders are idiots. We also saw a shirt with Obama as a turd which said "Don't forget to flush." I read often that Russians aren't friendly and seem dour (which I also read about Finns) and we saw no evidence of that. It may be that people in the hospitality industry are just very hospitable. I cannot recall a time when I was not fascinated with Russia, with the Czars and the story of the Anastasia, the daughter of Nicholas the Second who was executed with her entire family by the Bolsheviks. Or did she survive? I remember seeing a Hallamrk Hall of Fame teleplay starring Julie Harris as the maybe heiress and being so moved by it I got out a library book about the Romanovs and learned all I could. 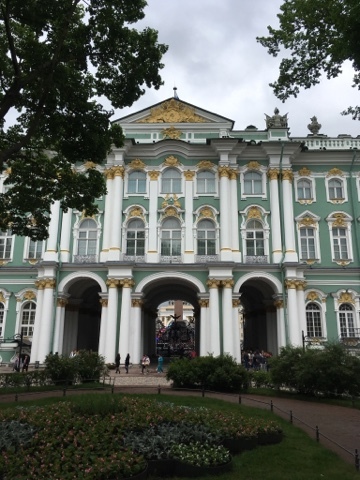 The Winter Palace, which was already becoming a museum by the time we were fighting the Civil War, is now The Hermitage, another thing I don't recall not knowing about. It is one of the top museums in the world and in truth, I never really thought I'd see it. It is enormous and its collection is amazing. Now, I've been to The Louvre, The Rijksmuseum, The Met, The Prado and I can say that I've never been so close to being trampled at any museum in my life. On June 22 1941, 3.5 million German troops began their invasion of Russia, a nation unprepared for Hitler's advance because Stalin refused to believe the intelligence he received. 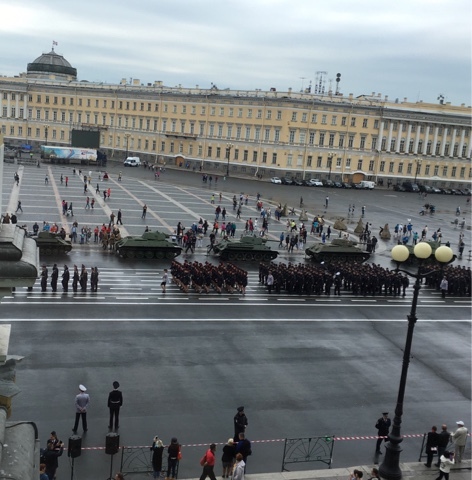 We were in St. Petersburg on that day this year and watched troops parade in the square in front of The Hermitage. There was also a display of WW ll vehicles and men in uniforms from that era posing with the many who wanted pictures. First, that the Russian, our allies, recall when they were caught unaware with far more pageantry than we remember Pearl Harbor. Second, that WW ll is being recalled in a most official manner, where we in the states have rather relegated it to Turner Classic Movies on Memorial Day weekend. On a side note, there were also opportunities for kids to hold old time weapons which many seemed eager to do. I watched a cluster of kiddos holding rifles and other long guns and thought - where do you think you are? Texas? This must be the most photographed thing in St. Petersburg. It is the Church of Our Savior on Spilled Blood. It was built on the site where Czar Alexander ll was assassinated in 1881 when his carriage was blown up. It was not the first attempt on his life. The interesting thing to me was the interior, which is all mosaics. Like everything else in this tourist town, there was a line to get in and it was packed inside. Outside, buskers and venders and snack sellers plied their trades. We tossed 100 ruble notes (75 to the dollar) Into backpacks and guitar cases and strolled down along the canal back to our hotel. And the two young musicians whose picture I posted on FB? They were playing La Cucaracha. This is a view from the deck of the Princess Maria, a ferry that hold about 1500 people and attempts to show them a good time as they cruise from Helsinki to St. Petersburg. 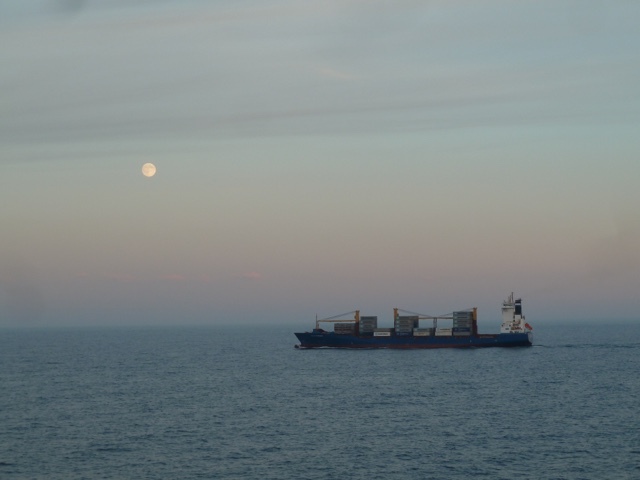 It is not a Carnival cruise. There is a small casino and some musicians, but passengers on this ship are aboard for only about 15 hours. The upholstery is blue velveteen and has seen better days, but it was not disappointing, as my expectations were realistic. We arrive in Russia at 9:30am and grabbed a cab to our hotel. I regret that we have no picture of our cabbie, a man of firm opinions with a thick accents and at high volume, but with many hand gestures and a rather jolly attitude.